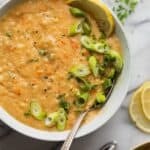 This traditional Lebanese Crushed Lentil Soup is my favorite childhood soup recipe! Made with simple pantry ingredients, it's vegan, hearty and healthy! In a large pot, heat the olive oil and saute the onions until they soften, about 5 minutes. Stir in the lentils, rice, cumin, salt and pepper, and cook for a few, stirring frequently until they are well mixed. Add the carrots and 8 cups of water, and bring mixture to a boil. Turn the heat to low and cook for 30 minutes until the rice and lentils are fluffy and fully cooked. Make sure to stir several times while cooking to prevent any lentils from sticking to the bottom of the pot. Using an immersion blender, pulse a few times to get the desired consistency. Stir in the lemon juice. Garnish with green onions and parsley, if desired and serve warm. Storage: Store any leftovers in an airtight container. The soup will last about 5 days in the fridge. Sourcing: You can find red lentils at Middle Eastern markets, natural-foods stores or even in large supermarkets, often located with other Middle Eastern ingredients. If you can't find red lentils, you can use yellow lentils in this recipe. You can also skip the carrots. You can skip the carrots if you'd like since they're not essential to the traditional recipe. Equipment: I love using my Cuisinart Smart Stick hand blender for blending soups. It's quick and easy and gets me the perfect consistency, without any chunks of vegetables leftover. Nutrition: Please note that the nutrition label provided is an estimate only. It will vary based on the specific ingredients used. This recipe is estimated for 6 servings.